Purification scale-up from milligram to hundreds of grams! SiliaSep (HP) Flash Cartridges offer incredible performance over competitive products due to the higher silica gel quality and innovative packing technology. Both cartridge series allow superior results and can be considered the products of choice for all purification needs. 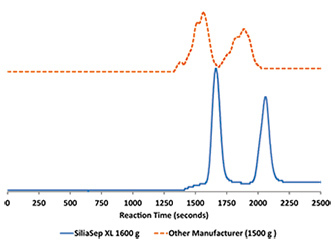 SiliCycle evaluated the performance of SiliaSep cartridges against some established players in chromatography and purification. 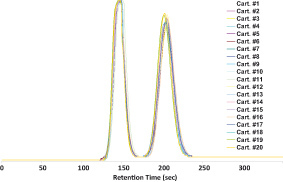 In this study, cartridge performances were evaluated by the determination of different parameters including plate count (N), reduced plate height (h), symmetry index (SI10%) and resolution factor (R). 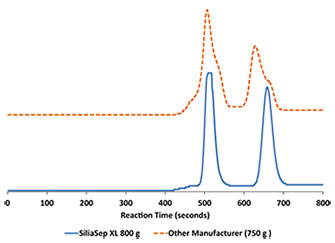 In all cases, SiliaSep allows excellent performance over the competition. As shown below, although both cartridges have a comparable symmetry index, the SiliaSep 40 g gives a better separation due to a higher plate count and a smaller plate height compared to the cartridge from the competition. The high resolution from SiliaSep HP allows the purification to run at a higher flow rate with the same high efficiency without compromising the quality of the separation. The high performance of SiliaSep HP, associated with the higher plate count, can also yield a higher loading capacity. 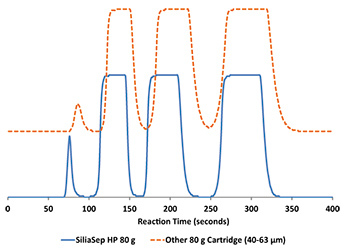 As shown in the results below, SiliaSep HP may be loaded with over 50% more products compared to other 40-63 μm cartridges and still provide very good separation. 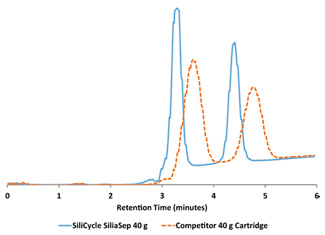 SiliCycle evaluated the performance of the SiliaSep XL cartridges compared to a well-known brand. For both sizes, SiliaSep XL outperforms the competition.